In the wake of recent cuts and government attacks on the welfare state, Class and Red Pepper have collaborated to produce a series of mythbusters designed to counter misinformation present in the media. 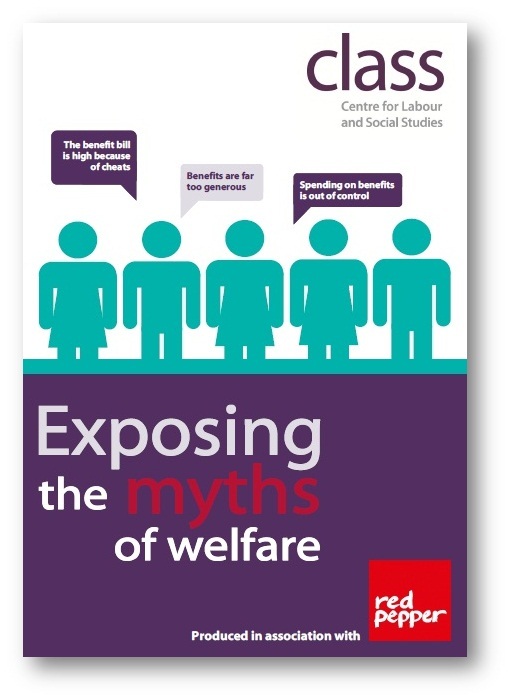 At a time when criticism of the infamous “benefits’ culture”, from politicians and journalists alike, is at its height, Class and Red Pepper have decided to dedicate the first pamphlet in the series to myths surrounding benefit claimants. Those receiving benefits are often treated as scapegoats, blamed for an increasing number of the problems our society faces. Ironically, it is actually this very mentality that is damaging to our society as it leads to divisions in communities, stigmatisation and leaves our welfare state open to attack. It is for these reasons that we believe it is vital to dispel these misconceptions. This briefing puts the spotlight on 12 myths using research provided by Ben Baumberg, Kate Bell and Declan Gaffney. You can download and read the briefing here. Work areas: Welfare State, Inequality. Tags: class, disability, equality, health, inequality, media, mythbuster, nhs, social state, unemployed.